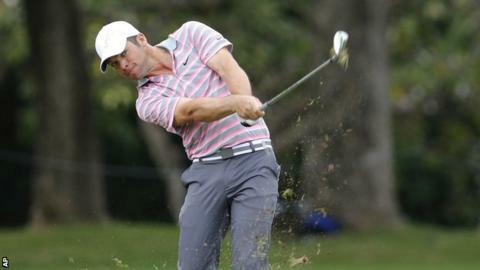 Englishman Paul Casey slipped back into a share of eighth place after round two of the PGA Tour's Sony Open in Hawaii. The 37-year-old world number 78 had led with a 62 but mixed four birdies and four bogeys in a level par 70 to remain eight under, four shots off the pace. Scotsman Russell Knox shares sixth after a 65 took him to nine under but former world number one Luke Donald is nine shots adrift in a share of 56th. Americans Matt Kuchar, Webb Simpson and Justin Thomas lead by two at 12 under. Thomas, who began his round from the 10th, tied the course record at the Waialae Country Club in Honolulu with a 61 that culminated in an 18-foot putt for an eagle at his final hole. Casey, a three-time Ryder Cup player, most recently in 2008, won the KLM Open on the European Tour last year but his sole victory in America remains a play-off success at the 2009 Houston Open. He dropped three successive strokes from the 13th on day two in Hawaii but recovered to birdie the 194-yard par three 17th. Meanwhile Donald, now ranked 33 in the world, who has not won on the PGA Tour since March 2012, birdied two of his closing three holes but also had three bogeys in a round of 69.